Larger Body and Space! 12.2 inches by 5.5 inches for easy sewing of any project! Fully Automatic Needle Threading--with a touch of a button! Color Touch Screen that works like your smart phone for easy swiping and enlarging of stitches! The JoyOS Advisor--on-screen tutorials, guided projects, and sewing techniques along with the User's Guide built in! Over 550 stitches including ones that sew and move in all directions! 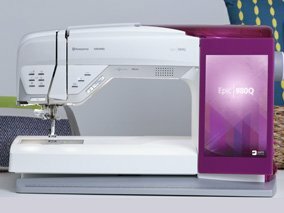 This is a truly Top-of-the-Line Sewing Machine! See more, and sew much more with the EPIC 980Q. Come in to see it in person!